The Chapel Choir of the University of King's College, modeled on the Chapel Choirs of Cambridge and Oxford, comprises twenty choristers selected from among the students at King's College and Dalhousie University. The choir's primary function is to sing at the weekly services of Evensong and Holy Eucharist, as well as other major services throughout the academic year. 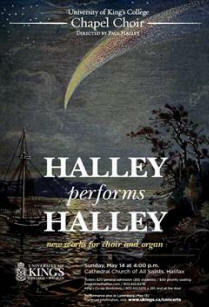 Since July 2007, Paul Halley has built the group into a fine ensemble which now includes touring and recording among its activities. 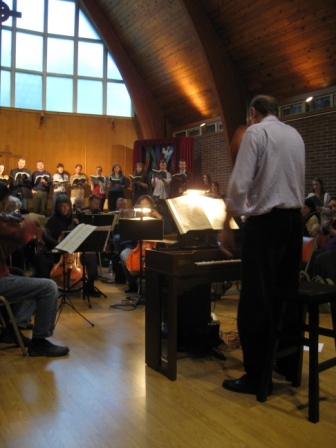 Paul Halley directs the Chapel Choir in Choral Evensong, Wednesdays at 5:00 p.m. and Solemn Eucharist, Thursdays, 5:00 p.m., during academic term. The Reverend Gary Thorne is priest-in-charge. King's Chapel is open to the King's College - Dalhousie University community and beyond. People of all faiths, or none, are welcome at all Chapel services. In 2015, Halley was appointed Organist and Choirmaster of the Cathedral Church of All Saints, Halifax, where he conducts a semi-professional choir in weekly services of Holy Eucharist, monthly Evensongs, and various celebrations of Lessons and Carols during the church year in a cathedral building that could claim the most beautiful architecture and acoustics in Canada. 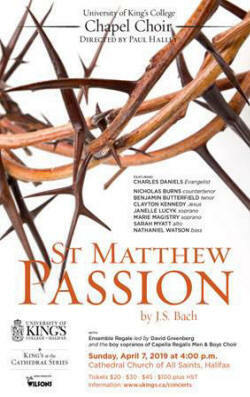 It has been five years since the Chapel Choir last performed Bach’s magnificent 'St Matthew Passion'. 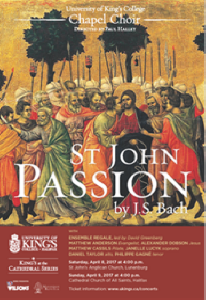 Scored for double choir, double orchestra, and soloists, this masterwork tells the story of Christ’s Passion using the narrative from the Gospel of St Matthew and additional texts by Bach’s librettist, Picander. 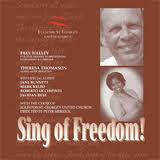 The role of the Evangelist will be sung by reknowned British tenor, Charles Daniels. The chamber orchestra, Ensemble Regale, is led by Baroque master David Greenberg and includes instrumentalists from Nova Scotia and across Canada. These performances will also feature the boy sopranos of Capella Regalis Men & Boys Choir and a line-up of stellar soloists from Canada’s early music scene. 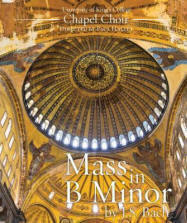 The Chapel Choir’s performances five years ago were named “the East Coast choral event of the season” by CBC Music. The University of King’s College has won a reputation for presenting world-class performances of the great Baroque masterworks right here in Nova Scotia. Please join us. Please note that due to a scheduling conflict with key players, there will be no Saturday performance of this work in Lunenburg. However, there will be a dinner concert with the soloists, accompanied by Paul Halley, at Cecelia's Retreat, Mahone Bay, on Friday, April 5, 2019, 6:00 pm. 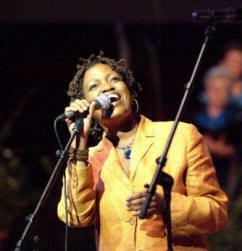 Please contact www.musiqueroyale.com for more information about the "Passion Dinner'. 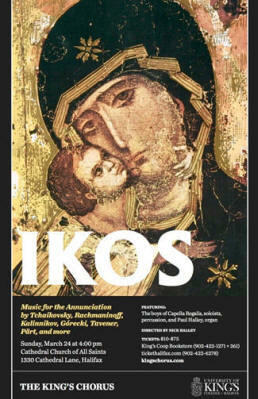 "IKOS: Music for the Annunciation"
With music from the Orthodox tradition by Tchaikovsky, Rachmaninoff, Kalinnikov, Gorecki, Tavener, Part, as well as the Candian Premiere of the moving and magnificent "Requiem For Dmitri", with texts by Pushkin and Ahkmatova, written by Paul Halley for his late friend, Dmitri Pokrovsky. 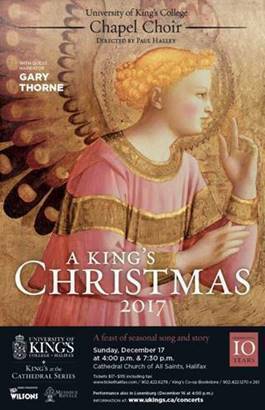 In its eleventh year, A King’s Christmas is a feast of seasonal song and story directed by five-time Grammy winner Paul Halley, featuring the University of King’s College Chapel Choir performing a beautiful blend of carols from the medieval to the modern. Don Connolly, former host of CBC Radio's 'Info Morning', joins the group as guest narrator and will intersperse the music with readings for the season, including poetry, excerpts from novels, short stories, and other literary works. No tickets are required for this service. 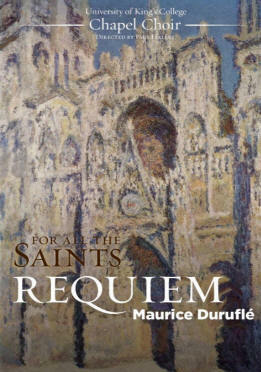 This annual tribute to those who have gone before and the opening concert of the 2018-19 King’s at the Cathedral concert series featured the supremely beautiful Requiem by French composer Maurice Duruflé (1948). 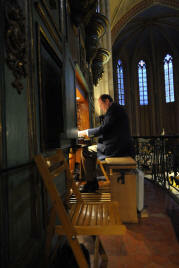 Duruflé dedicated the work to the memory of his father. 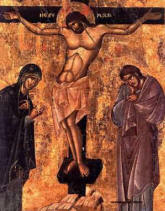 He had grown weary of increasingly overblown settings of the Requiem text and decided to return to the original Gregorian chant as his basic thematic material. 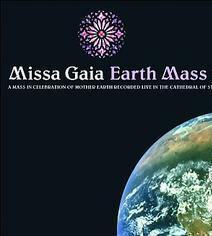 To the chant he added masterful choral and orchestral arrangements that call to the mind of the listener images of heavenly bliss deftly interwoven with a sense of human pathos and our longing for eternal peace. The Duruflé Requiem was performed with Ensemble Regale (a hand-picked chamber orchestra) and with Paul Halley as organist and Nick Halley directing orchestra and choir. 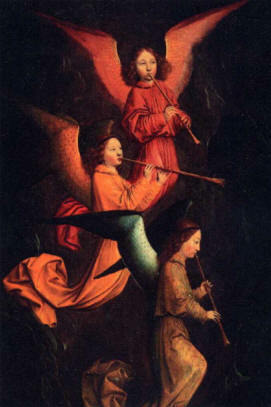 The concert also featured O quam gloriosum est regnum (O how glorious is the kingdom) by the English Renaissance composer William Byrd, a setting of Timete Dominum omnes sancti ejus (Fear the Lord, all ye his saints) by Italian Renaissance composer Ascanio Trombetti, G. P. da Palestrina’s Nunc Dimittis for double choir, 20th-century English composer Benjamin Britten’s Te Deum in C, and contemporary English composer Jonathan Dove’s Into Thy Hands. 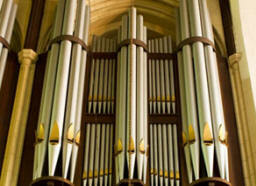 Music will include works by Byrd, Howells, and Bainton. Free will offering. 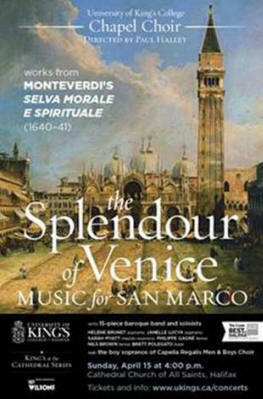 "The Splendour of Venice - Music for San Marco"
In its tenth year, A King’s Christmas is a feast of seasonal song and story directed by five-time Grammy winner Paul Halley, featuring the University of King’s College Chapel Choir performing a beautiful blend of carols from the medieval to the modern. The Reverend Doctor Gary Thorne, Chaplain of the University of King's College Halifax, a position from which he will be retiring in 2018, joins the group as guest narrator and will intersperse the music with readings for the season, including poetry, excerpts from novels, short stories, and other literary works. Saturday, December 16, 2017 at 4:00 p.m.
Sunday, December 17, 2017 at 4:00 p.m. and 7:30 p.m.
Also a Bach cantata and an arrangement of the same Bach cantata by Paul Halley. about this concert. Published November 1. 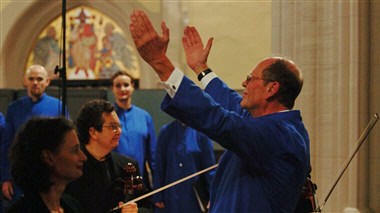 "The Majesty and the Mystery"
soloists in two performances of the great work. 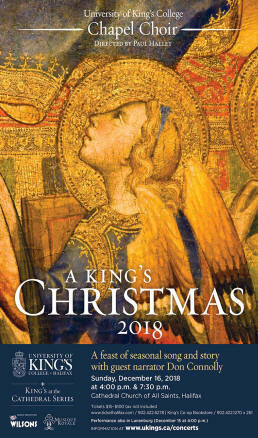 In its ninth year, A King’s Christmas is a feast of seasonal song and story directed by five-time Grammy winner Paul Halley, featuring the University of King’s College Chapel Choir performing a beautiful blend of carols from the medieval to the modern. Roberta Barker, Professor in the Foundation Year and Early Modern Studies at King's College and Associuate Professor of Theatre, Fountain School of Performing Arts, Dalhousie University, Halifax, joins the group as guest narrator and will intersperse the music with readings for the season, including poetry, excerpts from novels, short stories, and other literary works. Friday, December 16, 2016 at 8:00 p.m.
Saturday, December 17, 2016 at 4:00 p.m.
Sunday, December 18, 2016 at 4:00 p.m. and 7:30 p.m.
Paul Halley celebrates his first anniversary as Director of Music at All Saints Cathedral with a concert entitled Music for a Great Space. In the marvellous acoustics of the Cathedral where the choir sings every week from September to June, the concert highlights repertoire written over the centuries for the great Cathedrals of England and Europe, music that works equally well in this great Halifax space. Hence the title. 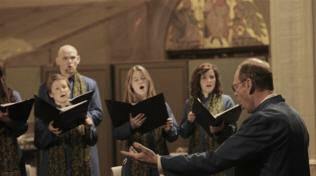 The University of King's College Chapel Choir suspended its cycle of Bach masterworks for one year to present another great pillar of the Baroque repertoire – the Vespers of 1610 by Claudio Monteverdi. 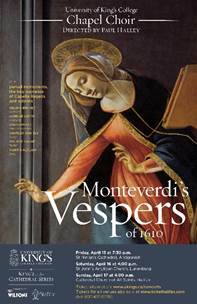 A monumental work scored for soloists, choir, and orchestra, the Vespers foreshadowed the religious masterworks of Bach and Handel, and has earned a place in the history of western music as a revolutionary and now iconic work. Stage and Television Actor, New York City. 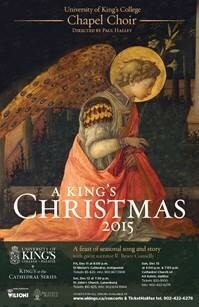 In its eighth year, A King’s Christmas is a feast of seasonal song and story directed by five-time Grammy winner Paul Halley, featuring the University of King’s College Chapel Choir performing a beautiful blend of carols from the medieval to the modern. Veteran New York City stage and TV actor R. Bruce Connelly joins the group as guest narrator and will intersperse the music with readings for the season, including poetry, excerpts from novels, short stories, and other literary works. Friday, December 11, 2015 at 8:00 p.m.
at 4:00 p.m. and 7:30 p.m. Featuring the Mass for Double Choir by 20th-century Swiss composer, Frank Martin, a work of impeccable craft and beauty, premiered in Hamburg, November 23, 1963. 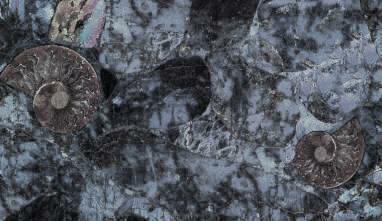 Also presented will be works by Byrd, Schutz, and Harris. served up with a glass of bubbly and appetizers. not to mention pretty well every major Canadian theatre festival. 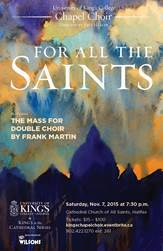 Saturday, December 6, 2014 at 8:00 p.m.
Friday, December 12, 2014 at 7:30 p.m.
Saturday, December 13, 2014 at 4:00 p.m.
King's at the Cathedral Series: "For All The Saints"
The University of King's College Chapel Choir, directed by Paul Halley, presents a concert commemorating All Saints Day in the perfect acoustics of All Saints Cathedral, Halifax. "Living the Arts in Italy"
CBC Radio 2 recorded this Halifax concert and it was broadcast on Choral Concert, Sunday, April 14, 2013, as part of ‘Bach Month’. 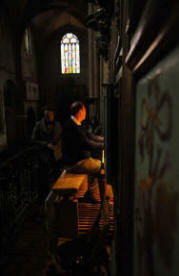 Commissioned by All Saints’ Kingsway Anglican Church, Toronto to celebrate the installation of its new Casavant organ. 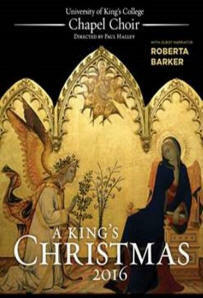 "Annual King's concert unforgettable" Read Stephen Pedersen's complete review of this beautiful concert. (from The Chronicle Herald Halifax) Click here for the review PDF. 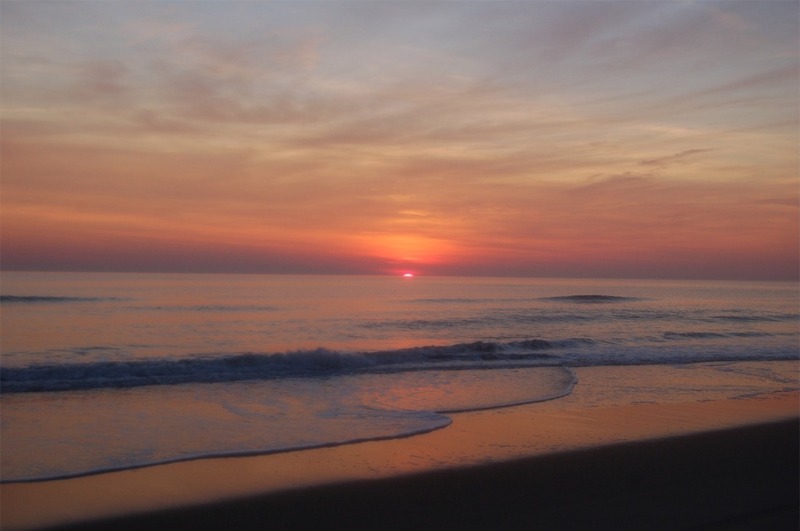 "A sensation of unearthly beauty floated like a luminous mist right into our imaginations." 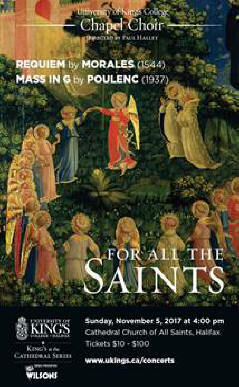 Hymn arrangement of "Joy To The World"
featuring The Choir of The Church of St. Andrew and St. Paul, its Director of Music and organist Jonathan Oldengarm, and a brass ensemble led by Jean-Michel Malouf,all under the direction of Jordan de Souza, conductor at the church. "Hi, Paul - Just a brief note to tell you that your arrangement was a huge hit. Honestly, I simply was stunned by it. How anyone can have something new to say about this tune astounds me. But you did. The 3rd verse, the trumpet repeating the sounding joy in imitation, and the final fanfare, up to the last note, it was all grand. Another winner!" 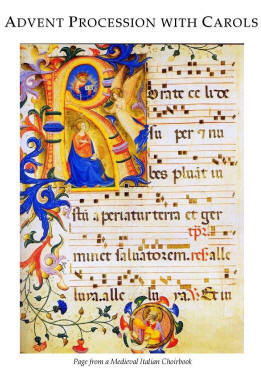 "Music from the Salzinnes Antiphonal"
Concert presented by the Gregorian Institute of Canada and the Department of Music at Dalhousie University. 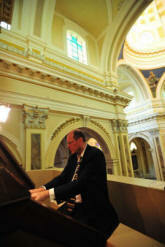 "3 choirs / 2 concerts / 1 commission"
Rufatti organ at Spivey Hall, Morrow GA where CD 'Triptych' was recorded. Howells "Take Him, Earth, For Cherishing"
First Metropolitan United Church, Victoria.